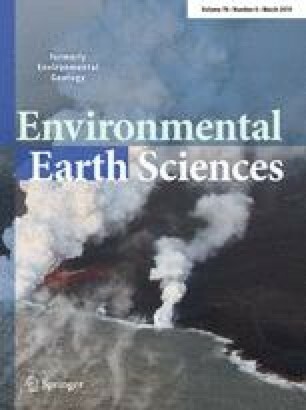 In this study, the radioactivity concentrations of the natural radioactive nuclides 238U, 232Th and 40K were measured in 26 surface soil samples of two areas of Libya. The soil samples were collected from two different agricultural lands in northwest Libya. The measurements of the activity concentration of selected radionuclides in soil samples were effectuated by gamma-ray spectrometry using hyper-pure germanium detector. The radiological hazard parameters: absorbed gamma dose rate, annual effective dose and the excess lifetime cancer risk were also determined to assess the radiation hazards caused by ionizing radiation emitted from the selected radionuclides on the population working and living in the selected regions. The levels of natural radioactivity of 238U, 232Th and 40K in the two areas were found to be below the internationally recommended level. On the other hand, these results indicated that there are no significant radiological impacts to the population because the values of radiological parameters are less than the international recommended limit. This indicates that the soils considered were safe for use in agriculture and do not pose any significant radiological hazards for human population.